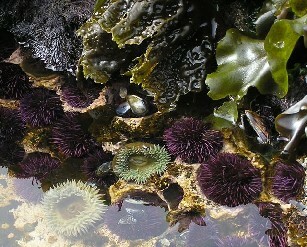 Explore the rocky seashore and tidepools! Learn about what it is like to live where the waves crash and plants and animals are sometimes in water and sometimes in air. Observe and study sea stars, limpets, sea slugs, snails, chitons, mussels, barnacles, crabs, worms, fish and octopods. Explore the different adaptations these animals have for holding on, moving and eating in the busy world at the edge of the sea. Learn about algae—where different kinds grow, which seashore animals eat algae, and how we eat and use it too! Come up with experiments to test your questions. Very importantly, learn how to treat the rocky seashore, and plants and animals that live there, with care.